Cofim Immobiliare Verona, for over 20 years, has been concerned with offering advanced marketing services to its customers by joining international networks of high importance in the world. Today Cofim is a member of Italian Network Realty (a consortium of over 20 real estate agencies that cover the Italian territory), Leading Real Estate Company of the World and Luxury Portfolio (network born in the United States which today has 565 real estate agencies located in 65 countries worldwide ) and finally EREN (exclusive club of selected European real estate companies). Today the Cofim customer who intends to sell a house, an apartment or a villa in Veneto or in any part of the world benefits from the sales services of the best international professionals and has the opportunity to exhibit their home on multilingual network real estate sites thus ensuring a wider visibility. Comfortably from your home and continuously assisted by the expert staff of Cofim Immobiliare you will then have the opportunity to purchase different types of properties in any country and in any continent, our colleagues are in fact present in: Asia, America, Oceania, Europe and Africa. The service we offer is UNIQUE in the Veneto region, and there are no additional costs other than the normal commissions you would have paid anyway by going to a real estate agency in a foreign country but with the guarantee that we will introduce you to the best real estate agents of all the world that will assist you in the sale or purchase of your property. In addition, our staff dedicated to the network is able to solve the linguistic problem: in fact, we speak fluent English, German, Spanish and Arabic. Come take a look at this wonderful 4 bedroom Dominican Republic investment property that we have to offer you. This one story villa is fully furnished and ready for you to move in. Decorated with classic style and porcelain tile floors. Spend some time relaxing around the pool area on the covered terrace with ceiling fans or enjoy a swim and a sunbathe. Invite some people over to pass the moment or just sit down to meditate and read a good book. Life is good and investing in a Caribbean Villa is a smart move. Feel at ease if you have toddlers because the terrace is fenced off from the pool. Grow a nice garden in the backyard surrounding the pool where you will have the full view of nature every day by glancing out of your bedroom window. The villa has 4 bedrooms and 3 bathrooms, occupying a total space of 314 square meters and the entire lot is of 947.6 square meters. The kitchen is set up with an oven, stove, refrigerator, freezer, microwave, blender, coffeemaker and utensils. Then you also have the living room, dining room space and parking area for two cars by the entrance. 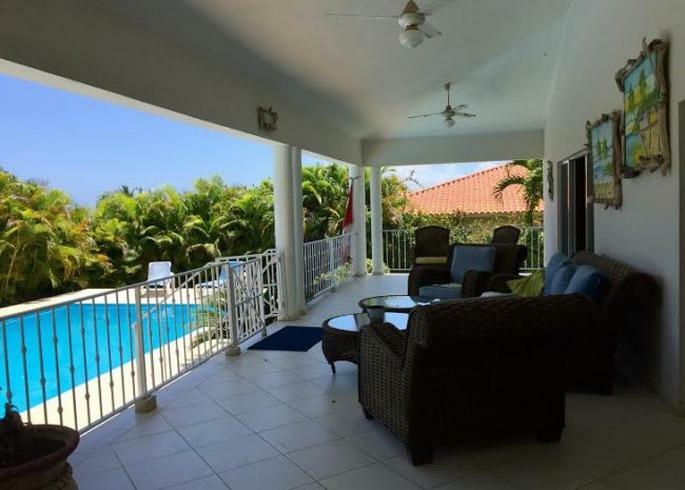 Located in a secured gated community, 15 minutes away from the Puerto Plata airport. Near the gated community, you will find supermarkets, great restaurants, beaches schools, and lots of family entertainment. In the towns of Cabarete and Sosua, you experience living on the north coast of the Dominican Republic. Renting the villa for a return on your investment can also be an option if you desire which can generate a steady income when you are not using it. 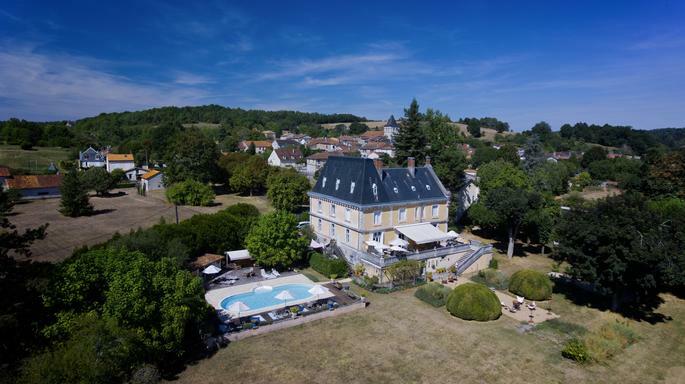 Excellently presented 19th Century Château complex renovated to a very high standard situated in the northern Dordogne, France with 2 additional residences in its grounds of 3 hectares. The main Chateau has 5 bedrooms, all with ensuite bathrooms, a library, dining room/lounge and an attractive bar on the ground floor. There is a large terrace and pool area. A large professional kitchen and storage areas can be found on the lower-ground floor. The Carriage house has 3 bedrooms and the summer house has 2 bedrooms. This exceptional property lends itself equally to a private residence or a boutique hotel business. 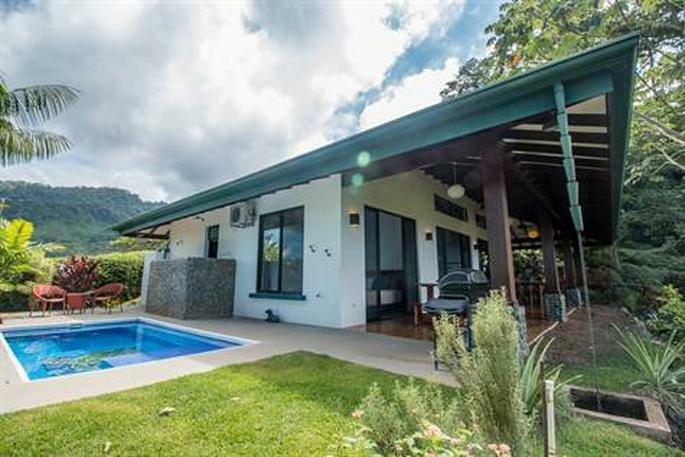 This beautiful home in Uvita is one of the few homes that are both your own and your budget, as the owners are motivated to sell.Situated on a flat ridgeline 7 minutes above the town of Uvita, this 2-bedroom / 2- bath home features an open floorplan, vaulted great room / kitchen, and a looong ocean view patio. The contemporary finishes (paint, furniture, etc.) are highlighted custom woodwork and quality craftsmanship throughout. Earth tone acid-washed concrete floors combine with cool colors and an abundance of the windows that invite the verdant jungle into your living experience.The kitchen features an island / bar finished with rare Cristobal hardwood, a 6-burner gas stove, and stainless steel appliances. A large master bedroom, a walk-in closet, a new A / C unit, a walk-in closet, and an extra bed. outdoor shower with views of the Pacific Ocean and southern jungle ridgeline. The second bedroom has a built-in closet, and could also be used as an office or a room with a futon.Outside, there is plenty of room for a dining, lounge, and bbq under the covered patio. Isla Ballena and the Osa Peninsula in the distance see "for 2-bedroom, ocean view house hunters. Welcome to 70 Parnell, 3 +1 Bedroom Brick Bungalow completely renovated from top to bottom on a large private lot with a newly built 1 and ½ car garage. 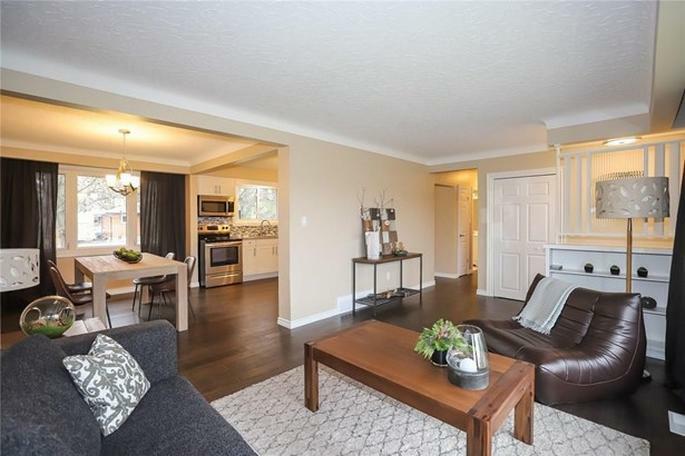 Located in the highly sought out area of North St. Catharines, you will find this great family home close to both elementary and secondary schools, Walkers Creek Trail, Welland Canal and Sunset Beach.The brand new white kitchen is equipped with new stainless steel appliances. There are 3 bedrooms on the main floor as well as a tastefully renovated 4 piece bathroom. The basement has a bedroom, new 3 piece bathroom, beautiful laundry room, family room with fireplace, and lots of storage space. Other features include 6 car paved driveway, separate entrance to basement, new flooring, and lighting installed throughout. Check out the virtual tour. A luxury villa 220 M2, part of a new residential complex located in the southern part of Mykonos, above Elia Beach. The villa features a private swimming pool and offers amazing sea views. It is situated 10 km away from the main town (Chora) and the Airport, just 200 meters from Elia beach and 1,5 km away from the beaches of Kalo Livadi and Kalafatis. The picturesque village of Ano Mera with its unique monastery is located 1.5 km away, where you can find – apart from taverns, patisseries etc. – a large Super Market, a bakery, a kiosk and a pharmacy for your supplies. The shops are usually open from morning until late evening. The villa is fully equipped – furnished and has a private garden, with uninterrupted sea view. It consists of four spacious bedrooms, a maid's room and storage. Two of the four bedrooms have en-suite bathroom and two built-in double beds and bedside tables, TV and several storage areas. The other two bedrooms are served by a shared bathroom. The guest room has its own bathroom and kitchenette. All bedrooms are equipped to the last detail. The ground floor has a large dining table for 8 people, a spacious living room with fireplace, WC and a separate kitchen, fully equipped with electrical devices SMEG and a table for 4 people. The villa is surrounded by a beautifully landscaped garden of 1.200 M2 and very large terraces of 200 M2 which are shaded by wooden pergolas and consist of a living room for 8 people, two separate dining areas of 6 and 10 people each, as well as a fully-equipped bar and barbeque. In front of the house there is a very large pool (size 14X7m.) with jacuzzi and fantastic sea view, which create a sense of relaxation and wellness. It is a very comfortable villa ideal for families or groups of friends and can accommodate 9 people, plus 2 people of staff. The house has Wi-Fi, satellite TV, air condition in all rooms, and a covered private parking for 4 cars. A luxury villa of 301,90 m2 built on a plot 4.016 m2 located in Andros Island. The residence is situated in front of the beach and offers a private swimming pool with amazing panoramic sunset sea views. Completed in 2000 and fully furnished, this beautiful summer villa, following a fresh Cycladic style with white cubic forms, is peacefully nested on an acre of land embracing the Aegean Sea. 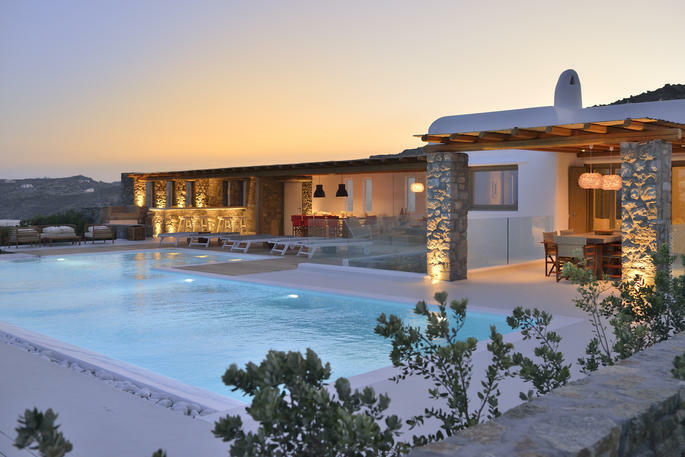 Located in Kipri, on the mid-western coast of Andros and only 5km from the port of Gavrio, this idyllic seafront villa can comfortably accommodate 8 guests in a total of 5 bedrooms. In its spacious living areas, the villa offers remote privacy, overwhelmingly spectacular sea views and unforgettable romantic sunsets. Spreading hillside on three separate levels, the property is surrounded by discreet, indigenous vegetation and garden areas. Its large outdoor terraces include a wonderful private swimming pool with sun loungers and hammock, while a variety of cozy sitting and lounging areas are spread around the residence. The ground floor spreads on three uneven levels, featuring a spacious living room with TV area, a fireplace-lounging area and a dining area with an open plan, fully-equipped kitchen, breakfast bar and laundry-storage room. The living room opens up to a shaded sitting area, offering spectacular views of the lower garden and the Aegean Sea. On the top floor, the villa offers one master bedroom en-suite and two independent double bedrooms, sharing a bathroom. All rooms access a wide terrace with stunning sea views. The garden floor features two bedrooms, one queen size bedroom en suite, and one twin double bedroom en suite, with views to the garden and the sea. Outdoors, the large swimming pool area includes a BBQ, a pergola-shaded dining area and an outdoor shower. Beautiful stone-paved stairs lead to the lower part of the garden with flat lawn surface, a rose garden and a plethora of other flowers. 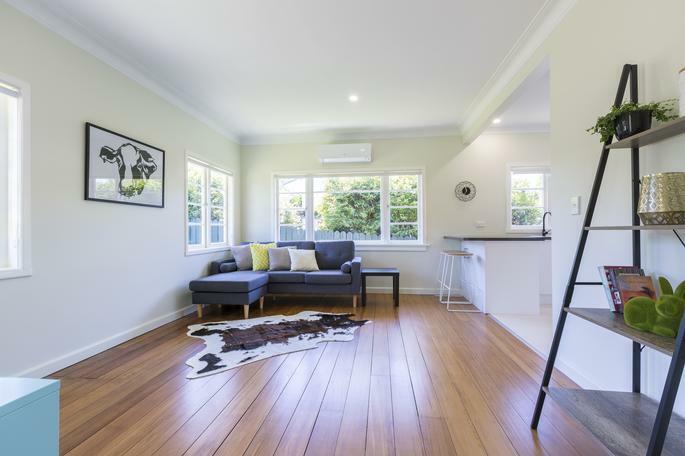 In a prime position in popular Waiuku, this immaculate, fully renovated home is ready and waiting for you to move in and enjoy. Fresh from an extensive renovation, the property has been given new life with a soft, neutral palette making the most of the light-filled interior. The high ceilings give a great sense of space while polished timber floors and plenty of casement windows reflect the home's original character. Off the entrance hallway, a generous open-plan living space flows through to the chic, modern kitchen with breakfast bar and separate dining nook. Plush carpeting features in both bedrooms which are bathed in natural light and fitted with built-in wardrobes. The fully fenced front yard provides a wonderfully secure space for kids, pets or pottering, and a newly planted vegetable garden at the rear will make for a great summer bounty. Sought-after Waiuku Primary School, sports fields and skate park are just a few steps away and a 10 minute walk takes you to main street shops, restaurants and supermarket. A little further out is the stunning Awhitu Peninsula with Regional Park, beaches, fishing spots and the famous Manukau Heads Lighthouse. 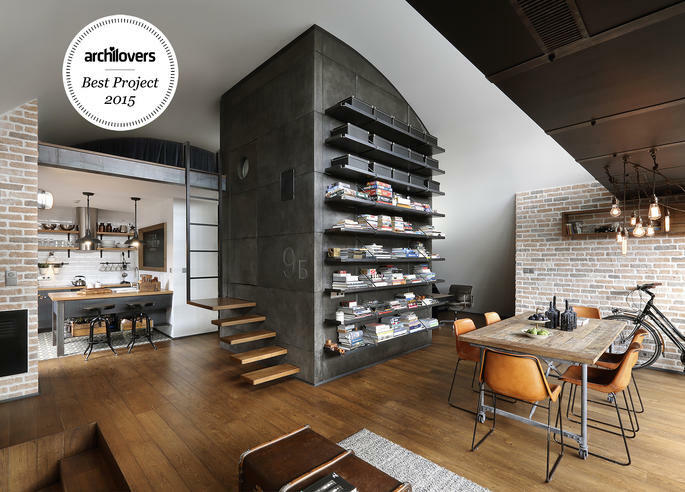 Loft 9b is an industrial style loft with custom designed furniture and vintage accessories. A Space full of crafty details, hidden surprises and well-balanced hipster modernity.A massive dark “cube” occupies the center of the living room, hiding the bathroom. The “cube” is clad in thin (16mm) custom made concrete panels that continue inside as well. The entire apartment has been outlined with tall cantilevered aluminium planters - a green aura that surrounds the entire place and makes the terrace appear like a serene courtyard - completely sheltered from the outer world.The wardrobe in the bedroom ( designed to look like an old suitcase ) hides a floor level build-in bathtub situated on a second level of the 4.5m space - an area which is used for a guest bedroom / bathing space. This Dominican Republic is a residential villa development. 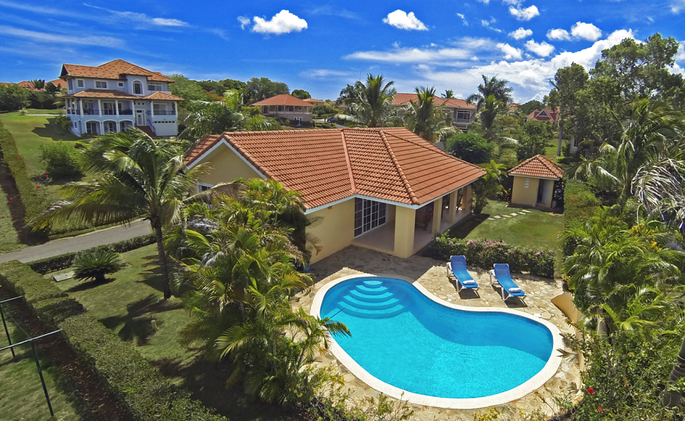 The gated villa community has a magnificent view of the town of Sosúa and beaches.The main floor provides you with 3 large and 3 bathrooms, a spacious living and dining area, a well-equipped kitchen. From the terrace, the pool area and the beautiful tropical garden. This is a very beautiful and comfortable home!Below you find a full apartment with 1 bedroom, 1 bathroom, kitchen, living and dining area. For a private entrance which is perfect for extra rental income! This gated community offers security service as well as water and electricity around the clock. On-site management and rental service.The property offers a stylish living and dining area, a bathroom, a kitchen, a living room and a dining area. This is perfect for extra rental income! Further attributes include a garage, ...This gated community offers security services as well as water and electricity around the clock, on-site management, and rental service. Inspired by the surroundings, this chic modern home is a rare combination of warm and welcoming with incredibly well thought out and executed design. Conceived as a modern interpretation of the typical barn with Glu-lam exposed beams, this home features an open floor plan and mesmerizing views of the Catskill Mountains and lush rural setting. Floor to ceiling glass allows for the blurring of interior and exterior spaces. The kitchen is open to the living and dining areas, incorporates the best of the best appliances and is a joy to be in. The private areas, 3 bedrooms, 4.5 baths and 2 loft-like offices, are housed in spaces inserted into the copper and glass skin, again directing the eye to views of the pond and mountains. The master suite, with 2 separate walk-in closets and 2 full baths provides an unusual and surprising design element. 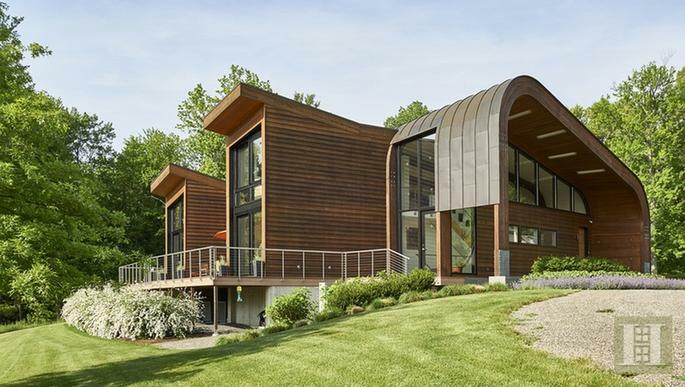 Various green features make this a modern 21st century home; radiant heating, solar panels and LED lighting. Located in mid-Columbia County, near OMI International Art Center and convenient to all the magnificent Hudson Valley and Berkshires have to offer. AMTRAK in Hudson is a quick 20 minutes. Explore and enjoy the myriad cultural activities, shopping, fine dining, historic sites, outdoor activities and remember to relax.